Actually, before we talk about Nintendo 3DS, I’d like to talk about the Virtual Boy system.3 3Virtual Boy: A home video game system released in 1995 in Japan. Users looked into an eyepiece with a screen inside and played games displayed in 3D images. In 1995, when the Virtual Boy went out into the world, I wasn’t at Nintendo yet, but one day when I visited Nintendo, then-president Yamauchi said Nintendo had made something and he told me to take a look at it. It was the Virtual Boy system. You were with me that time, Itoi-san. Virtual Boy was, I think, a commercial failure. Normally, I think it would have been understandable if Nintendo experienced a kind of trauma with regard to the whole 3D genre. But Nintendo continued to doggedly make attempts in 3D technology. And you could say that those attempts have now finally borne fruit. I feel like that is an interesting progression of topics. Nice intro! 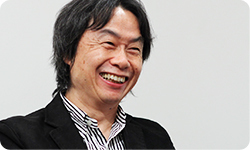 (laughs) I imagine Miyamoto-san has a unique perspective on this. At the time, I was close to the company, but I was an outsider nonetheless. 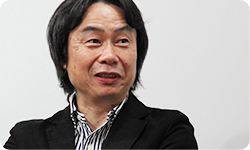 Miyamoto-san, however, was actually involved with it. Yeah. (laughs) Well, as far as my position went, I wasn’t actually a central player. And that’s a little complicated, too. Oh, right, right. That was (Gunpei) Yokoi-san.4 4Gunpei Yokoi (1941-1997): While at Nintendo, he played a central role in developing such products as the Game & Watch handheld electronic games, the Game Boy handheld system, R.O.B. (Robotic Operating Buddy), and the game Dr. Mario. 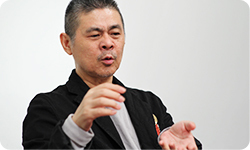 Central to development of Virtual Boy was Gunpei Yokoi, the father of Game Boy. Let’s see… To start at the beginning, at the time I was interested in virtual reality, and was one of the staff that went on and on about how we should do something with 3D goggles. I didn’t exactly twist his arm, but I would talk with Yokoi-san about how (3D) goggles would be interesting. But then when development of Virtual Boy actually began, I was busy developing the Nintendo 64 system.5 5Nintendo 64: A home video game console released in June 1996 in Japan. It was released in Europe in March 1997. 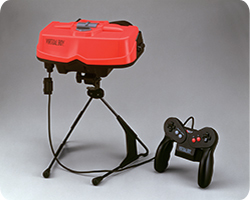 Development of the Virtual Boy and Nintendo 64 systems completely overlapped. Right. Another complicated thing is that 3D graphics were a major theme for both Virtual Boy and Nintendo 64. Things may have turned out differently if the two devices shared their technology, but they had different purposes. If you think of Nintendo 64 as made to confront 3D head-on, Virtual Boy was using different technology to aim at enjoyment of 3D without rushing in the general direction 3D was headed at the time. To be more concrete, Virtual Boy was aiming at using wire frame models6 to simulate a 3D space. If you think about the power of CPUs at the time, that makes sense. But not many games used that method of visual representation. Most of them lined 2D images up at different depths to create a three-dimensional effect. 6Wire frame: One way of achieving three-dimensional graphics. It uses only lines to represent three-dimensional spaces and objects. At the time, as I was working on the Nintendo 64 system, part of me thought we should use wire frames to render 3D graphics, but I also thought that wire frame images weren’t terribly appealing. If nothing but wire-frame fighter craft had appeared and Mario and other beloved characters had never shown up, that would be a little sad. But if you only changed the depth of a 2D image of Mario, it wouldn’t bring out the real appeal of Virtual Boy. So the Virtual Boy system was a complicated affair. Anyway, those red-and-black visuals were at a bit of a disadvantage at that time when the graphics for video games were rapidly getting richer. Yeah. But I thought of Virtual Boy as a fun toy. It was the kind of toy to get you excited and make you think, “This is what we can do now!” I imagined it as something that people who were on the lookout for new entertainment or who could afford to spend a bit of money could buy and enjoy even if the price was a little expensive. But the world treated it like a successor to the Game Boy system. It’s even got the word “boy” in its name. That was also true within Nintendo. Our sales department treated Virtual Boy as an extension of our licensing business. In other words, we sold it as something like the Famicom system. In other words, if you think of it as a gaming platform. Right. When you think of it as a gaming platform, it becomes a failure. There was no way for Nintendo to escape it. Everyone assumes that when Nintendo puts out a machine, it must be a full-blown gaming platform. Yeah. It can’t be helped. Which is exactly why at the time I thought it was extremely important to portray it properly, including advertisements and sorts to the effect that it’s not a full-scale platform. But you weren’t a main player on that device, so you couldn’t say anything. I didn’t have the authority. So if I can come up with an extreme, it may have been all right if games for Virtual Boy didn’t continue to come out for years and years as it would have been an enjoyable toy for what it was. I thought that it could be enjoyed plenty if there were about five really good games. The most ideal scenario would have been for things from there to catch on to the point where it would be its own market by becoming a licensee business. Yeah, it’s not very cool. I thought we needed to treat it like a niche product. I suppose so. I would be having a hard time to make an advertisement to make it look cool. Virtual Boy had two big tasks to accomplish, and it went out into the world without satisfying either one. It’s not so much that the machine itself was wrong as a product, but that we were wrong in how we portrayed it. I’m not sure how to put it, but there was no way for the Virtual Boy game console to permeate daily life. Put another way, Nintendo’s products were entertainments that had always been able to enter into everyday life. There isn’t anything particularly strange about viewing Virtual Boy as a slightly unusual toy that you can enjoy apart from everyday life, but when lined up with Nintendo’s other products, I imagine it didn’t quite fit in. I suppose not. If you think about it, when the Famicom system got its big break with Super Mario Bros.7, it was talked about as impacting people’s lives at home. Since siblings and other family members were wrestling over the controller, I guess it was a part of everyday life. 7Super Mario Bros.: An action game released for the Family Computer (Famicom) system in September 1985 in Japan. It was released in Europe in May 1987 for the Nintendo Entertainment System. And Nintendo has focused even more on entering into daily life in the last few years with the Nintendo DS and Wii systems, so Virtual Boy looks even more out of place. A long time ago, we did make out-of-place stuff, though. Yeah. Like the Love Tester.8 8Love Tester: A toy released in 1969. Released as a machine that would determine compatibility by measuring the amount of electrical current passing through people holding hands. And the Automatic Ultra Scope.9 9Automatic Ultra Scope: Released in 1971. A toy modelled after the periscope. The periscope runs on electricity and extends and retracts. The Ultra Machine.10 10Ultra Machine: Released in 1968. An indoor pitching machine that would fire table tennis balls that could be hit with a plastic bat. Special curved balls were also used. If you think of Virtual Boy as an extension of such toys, you could say it is quite in keeping with Nintendo’s products. I think so too. That’s why I think it would have been most ideal if it first started out as a toy, and then organically evolved into a gaming platform. However, ever since Famicom, people tend to think of Nintendo’s game consoles as a set with the licensing business. Put another way, certain things are expected of it. In other words, Nintendo is a company that, when it hits the mark, sells ten million of something. If you don’t sell that much, it’s considered a failure. So anyway, we sure have talked a lot about Virtual Boy! It was very interesting. Now moving on.